The Epiphanius text on the mystery tongues of Corinth. One of the most important works for unlocking the riddle. This fourth-century or so text gives new light on an old question. Epiphanius’ answer is found in the ancient Jewish liturgy of speaking and interpreting. The following is an analysis of the text.
. . . Therefore languages are from a grace of the Spirit. Of what kind does the Apostle speak? He knew how not only the different Hebrew sounds, and manifold expressions in every single word with skills adorned with eloquence, but also the proud language of the Greeks; some who boast the ability to speak Attic, Aeolic, and being able to utter the language of the Dorics, of whom had caused the disturbances, and factions within the Corinthians, to which the Epistle was dispatched. . . . And he confessed the gift which is having the ability to proclaim [the oracles] with the Hebrew words and also teaching the Law to be a spiritual endowment. And he agreed that it is a spiritual grace to proclaim and to teach the Law in the Hebrew words. What did Epiphanius mean by this? The Epiphanius text states two things about the Corinthian conflict: it was a clash between different Greek ethnic groups and the Hebrew language had some type of role in the Corinthian assembly. There was no reference to an out-of-this-world mystical experience, or something supernatural. Hebrew, Greek, teaching the Law — these indicators combined suggest it to be a liturgical or didactic problem within the Corinthian gathering. This necessitates to find more information on early Church liturgy for answers. It was the reading of the Law in Hebrew and an interpreter(s) translating it into the local vernacular that caused the problem. Jewish tradition had a specific liturgy concerning Jews worshiping together outside of Israel; the Law was to be read in Hebrew and an interpreter was to stand beside the reader and translate it into the local tongue. It could be inferred, though not conclusively from this, that the Corinthian Church had adopted this form of Jewish liturgy but ran into problems concerning which Greek language the interpreter was to use. This may be stretching the text more than what the writer intended and such a relationship cannot be concretely established. Or, it could be that Hebrew was the language of instruction and religious devotion within the earliest Corinthian assembly. This tradition was continued from the Jewish synagogue. Those masters who were instructing/lecturing on the principles of the Christian faith did so in Hebrew, while an interpreter was required to translate it into the local vernacular. The conflict was in which Greek vernacular was most suited for the Corinthian congregation. The second option may be a more acceptable interpretation. The Epiphanius’ account is a base element for a series of articles called The Tongues of Corinth to prove or disprove the above theories. The goal of this series is trace the role of the reader, speaker, and interpreter starting from the rites found in the Jewish diaspora, specifically Corinth, to its transition into Church office, if there is such a relationship, and mapping this evolving rite until the thirteenth century. The text itself is one of the clearest and logical found so far written by a Church Father. However, this work, along with Jewish writings on public reading, are four centuries removed from the actual Corinthian tongues saga. It could be a later interpretation. This problem needs to be addressed. Why has this text never been popular in describing the Corinthian tongues debate? It is a mystery why this passage has never come up in any critical discussions on the problems tongues of Corinth. Frank Williams’ work, The Panarion of Epiphanius of Salamis, Book 1 (Nag Hammadi Studies, 35)1 contains an already available English translation, though he, nor anyone else makes no correlation to I Corinthians in the translation of the text found at the header scholion 13 and 21. The only critical look into the position of Epiphanius on the gift of tongues is the The New Schaff-Herzog Encyclopedia of Religious Knowledge. Unfortunately, the contributor, PKE Feine, totally ignores this passage and utilizes a completely different but much weaker citation made from the Panarion XLVIII:4. The citation and commentary leads the person to believe that Epiphanius wrote it to be an ecstatic utterance relative to the Montanist movement.2 The Montanist connection is a necessary one for those scholars who hold speaking in tongues as glossolalia. This omission is a major oversight by Mr. Feine. Epiphanius was attacking a person named Marcion for allegedly altering the text in I Corinthians 14:19 to suit his own needs. It is known that Marcion was the son of a Bishop, and perhaps was a Bishop himself, but at some point there was a clear break between himself and the institutional Church. A translation problem with the key text. This version fits nicely in with Epiphanius’ argument that Marcion is adding to the Bible and creating a heretical version. The Epiphanius text shortly afterwards uses this as a springboard to call Marcion many harsh names. The Ambrosiaster text demonstrates that there was some type of tradition connecting I Corinthians 14:19 with the Jewish Law. How widespread this tradition was throughout Christendom in the early centuries is not known. There is a third potential problem and that has to do with the similarity in the Greek between the word mind — νόος and Law — νόμος. They are very close in spelling with only a one letter difference. It could potentially be easy for a manuscript writer to confuse these and cause a transmission error. This may be a remote problem because the Greek grammar in this situation has them distinguished by case. Mind is in the dative case – νοΐ and Law is in the accusative — νὸμον. It would be hard to get them mixed up. However, it is not outside the realm of possibility that a play on words was happening here. The writer(s) went on a tirade against Marcion and slandered him with homophobic references against having made such a change. However, the author(s) failed to realize that this change is not unique to Marcion and was present in some legitimate Christian communities as noted in the Ambrosiaster text above. There is a disclaimer about the authorship and date–two factors that do not change the outcome. The work is customarily credited to Epiphanius, Bishop of Salamis in the fourth century. This text may have been heavily edited, redacted and even added over the centuries since its original release. We are not sure whether it is a fourth-, fifth- or sixth-century opinion. Even with this problem of textual criticism and dating, the work still reflects an ancient one. However, the nature of Epiphanius assertion that there was a direct Jewish correlation to the problem tongues of Corinth suggests that this was part of the original text. Later editors or writers would not have added such a connection. 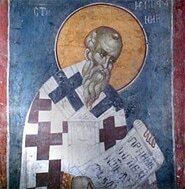 The Gift of Tongues Project: Epiphanius and scroll down to the Ephanius section. The New Schaff-Herzog Encyclopedia of Religious Knowledge. Samuel Macauley Jackson ed. Volume 11. New York: Funk and Wagnalls. The Tongues entry written by PKE Feine. Pg. 37.